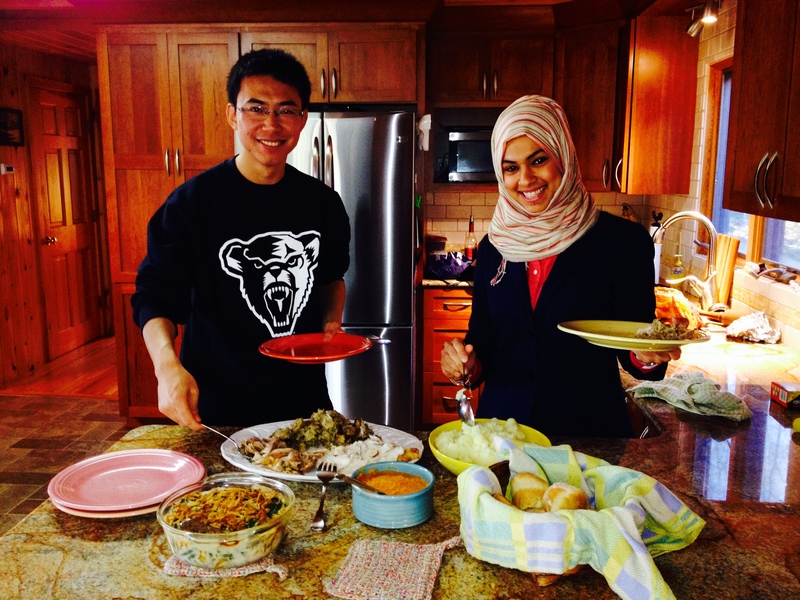 International students Peter and Sara experience their first American Thanksgiving. Thanksgiving has always been my favorite holiday. I love all the traditional Thanksgiving foods like roasted turkey, mashed potatoes and gravy, sweet potatoes, and especially pumpkin pies with a generous topping of freshly whipped cream. I even like the much maligned green bean casserole with the french fried onions on top. But the food isn’t the main reason that I look forward to celebrating Thanksgiving every November. And it’s not because of the Macy’s parade with all of the giant balloon characters or the football and basketball games that follow. And it most definitely not the way that major retailers can’t even wait until most folks have finished their holiday meal on Thursday to throw open their doors for Black Friday sales kicking off the Christmas shopping season. No, what I like about Thanksgiving is that it brings family, friends and even strangers together to share a meal, fellowship, and to recognize and give thanks for people and experiences that we often take for granted during the rest of the year. Growing up, Thanksgiving was always a family affair, usually with a mix of aunts, uncles, cousins and grandparents gathering to share a meal and conversation. There was a warmth and ease about these gatherings, at least from my prospective as a child, and I looked forward to the next opportunity. When I went away to graduate school in Oregon, my studies and my limited finances made going home for Thanksgiving prohibitive. Fortunately, several other students were in similar straights, particularly the foreign students, and we decided there was no reason for us to miss the spirit of the holiday. We put together a Thanksgiving potluck at the off-campus apartment of a young woman from New Zealand who provided a delicious roasted leg of lamb with mint jelly as the main course and the rest of us brought side dishes. I had never tasted lamb before that day, but I was curious enough to give it a try. It was the start on a lifelong appreciation of exploring new foods. More importantly, this new experience of sharing a communal meal with other people of differing cultures and backgrounds, helped gain perspective about how we have much more in common with others than we realize. As the years went by and I had my own family, I continued the tradition I learned growing up and would invite our relatives to our home to share a Thanksgiving meal. The meals, while less than expertly prepared, helped to provide an atmosphere where my family and my husbands family could get to know each other. It was an opportunity to practice gratitude. As I prepared the meals, I would often think back to that Thanksgiving in Oregon when I was made to feel welcome in the company of people I didn’t know well or at all. I can’t say for certain when it happened for the first time, but we began to ask others outside the family to join us on Thanksgiving to share our dinner and conversation. Sometimes it was people we knew personally and at other times it was friends of friends and even folks who were unknown both to us and our other guests. It was no trouble to make a little more room at the table. It made the conversations more interesting and allowed for new insights. It helped us to be more thankful for all the blessing that we have and can share with others. Our extended families now live thousands of miles away and it can be difficult for us to be together on the holiday. But that doesn’t stop us from celebrating with a big turkey and all the fixing. Only now the guests are usually friends or neighbors. The past couple of years we have begun inviting foreign students from the nearby university to come and join us as we celebrate Thanksgiving. It gives both them and us an opportunity to learn more about each others cultures and helps to promote empathy and understanding. I am thankful for the opportunity to share my favorite holiday. This entry was tagged communal meal, empathy, Family, foreign students, Gratitude, shared meals, Thanks, Thanksgiving, traditions, Turkey. Bookmark the permalink.